For a long time, a significant career home run record rested in the hands of one of the country’s first superstars, one of its most charismatic players, only to be broken twice in the recent past. No, this article is not about Major League Baseball (MLB) home run kings Babe Ruth, Hank Aaron, and Barry Bonds. It is about the MLB home run kings of Canada, from Gary Carter to Carlos Delgado through Joe Carter, more than 40 years after MLB expanded to Montreal. This article examines long balls hit on Canadian soil. Over the years, Canadian home runs have included baseballs in the public pool adjacent to right field at Jarry Park, balls rolling forever on the football field at Exhibition Stadium, and shots under the roof at Olympic Stadium and the Skydome/Rogers Centre. At the end of the 2010 season, 9,816 long balls had been hit in Canada during regular season MLB games, with an extra 44 hit in playoff games. The first section examines the history of the record and the leaders. In the second section, we look at Canadians homering in their homeland. Major League Baseball crossed the border for the first time on April 14, 1969, when the St. Louis Cardinals took on the Montreal Expos at Jarry Park. Veteran Mack Jones became the first to homer in Canada, a three-run shot in the bottom of the first inning, off Nelson Briles. Dal Maxvill and Joe Torre later homered for the Cards in that game. The left field bleachers were named Jonesville after Jones hit five dingers in their direction in the first 21 local games. 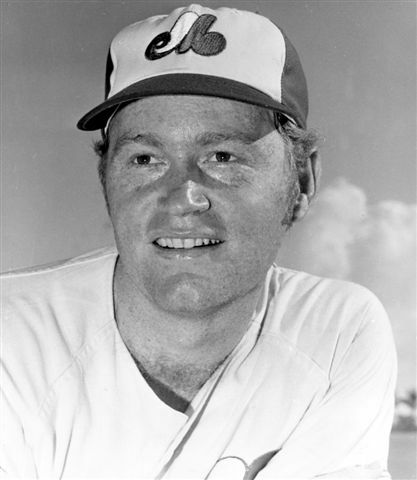 However, by the end of that first season, he had been eclipsed by The Sporting News Rookie Hitter of the Year Coco Laboy and the first Expos star, Rusty Staub, who concluded the season with 12 home runs each in Montreal. Among visitors, Willie McCovey stole the spotlight with four home runs in six games. His most memorable one came the following year however, when he skied a pitch from Steve Renko clear over the scoreboard in right field, a shot described as terrifying by the Montreal Gazette.1 A decade later, McCovey would hit the 521st and last home run of his career, a solo shot off Scott Sanderson, in Olympic Stadium. In 1970, with Laboy suffering from a severe case of sophomore slump, Jones and Staub exchanged the career lead in Canadian home runs. Le Grand Orange eventually prevailed, taking the lead for good on August 1.
four overall leaders at Jarry were left-handed hitters like Fairly. The 1977 season saw two major changes for Canadian baseball. Olympic Stadium replaced Jarry Park in Montreal and MLB added a second Canadian franchise, the Toronto Blue Jays. Major League Baseball made its debut in Toronto on April 7 in Exhibition Park. Jays’ first baseman Doug Ault stole the show that day, hitting his first two major league home runs, both off Ken Brett of the White Sox. Al Woods added a pinch-hit shot for the Jays and Richie Zisk became the first visitor to homer in Toronto. Among those original Blue Jays was Ron Fairly. He set many Canadian firsts that year, including being the first to represent both Canadian franchises at the All-Star game. More importantly for our purposes, Fairly also became the first to homer for both franchises, and by season’s end, he was the career leader in home runs for both Montreal and Toronto, upping his Canadian long-ball total to 68. That would be his final tally, as he was traded to the Angels after the season, never homering again in Canada. Among visitors, Yankee Cliff Johnson made the best impression with a three-home run game in June, followed by a pair of home runs in a September game. That display of power probably played a role in the Jays’ decision to acquire him for the 1983 season. He briefly held the visitors’ record in Toronto, but in the end, Red Sox slugger Jim Rice emerged as the most prolific visiting slugger at Exhibition Stadium, with 18. While the Jays were taking their first steps, future star Gary Carter was welcoming the Big O in major fashion. He hit 22 home runs in Montreal in 1977, shattering the record for most Canadian home runs in a year. Carter was far from done, and on April 21, 1981, Carter left a Canadian yard for the 69th time, making him the lone Canadian home run king. When the Kid connected off reliever Alejandro Pena of the Dodgers on May 30, 1984, he became the first to reach 100 Canadian home runs. Carter was traded to the Mets after the season. He came back to the Expos in 1992 and hit his final two Canadian home runs, ending his career with 121 home runs in Canada, all in Montreal. Then Phillies third baseman Mike Schmidt emerged as the most feared visitor in Montreal. On August 7, 1984, Schmidt hit his 23rd career Canadian home run, allowing him to take the lead from Stargell. Schmidt continued to make a habit of profiting from his trips north of the border, ending his career with 32 Canadian home runs, all in Montreal. This number includes the home run he hit against Stan Bahnsen in the next-to-last game of the 1980 season, knocking the Expos out of the pennant race. Olympic Stadium was the theatre of home run controversy early in its existence. In June 1977, a monster shot by Dave Kingman seemed destined to the seats when the blast hit the concrete rim, 150 feet above the playing field. Umpire Bruce Froemming called it a foul, to the dismay of the Mets.5 For the following home-stand, a line was painted on the rim to designate foul territory and prevent a reoccurrence.5 Darryl Strawberry, on opening day 1988 off Randy St. Claire,6 and Henry Rodriguez, in 1997 off the Tigers’ Brian Moehler, were the only ones to hit the rim for a home run.7 Both shots were estimated at 525 feet. The early 1980s saw the first playoff games in Canadian territory. The Expos qualified for the postseason in the 1981 strike season. During the Division series, the Phillies’ Keith Moreland hit the first Canadian postseason home run. Carter homered in Game 2, and the Expos won the series to move to the League Championship series against the Dodgers. Jerry White hit a crucial round-tripper for the Expos in Game 3, but the big home run, certainly the most famous long ball ever hit in Montreal, came in the decisive Game 5. In the top of the 9th, with ace Steve Rogers coming out of the bullpen, Rick Monday hit the circuit blast that sent the Dodgers to the World Series. The Jays qualified for the 1985 postseason, but were beaten by the Royals in the ALCS without homering at home. Surprisingly, Royals’ outfielder Pat Sheridan, who had only three long balls in the regular season, became the first to have two career Canadian postseason home runs with a pinch-hit shot in Game Two and a crucial home run in Game Seven. Two outfielders had parallel success stories in Canada in the 1980s: Andre Dawson and Jesse Barfield. Both had great careers in Canada, but were traded away just before reaching 100 career Canadian home runs. Both achieved the feat as visitors during the 1989 season. Dawson reached it first on June 18, with the Cubs, as he homered off Mark Langston. Barfield followed on August 6, as he took Todd Stottlemyre deep, a few months after he was traded to the Yankees. Both players retired with 102 Canadian dingers. Barfield was also the home run king at Exhibition Stadium, with 99 long balls. The 1989 season also marked the opening, on June 5, of the SkyDome in Toronto. Exhibition Stadium had closed in grand fashion with a walkoff home run by George Bell off Bobby Thigpen of the White Sox on May 28. Fred McGriff was the first to homer in the new park, marking the start of a golden age in Jays history. 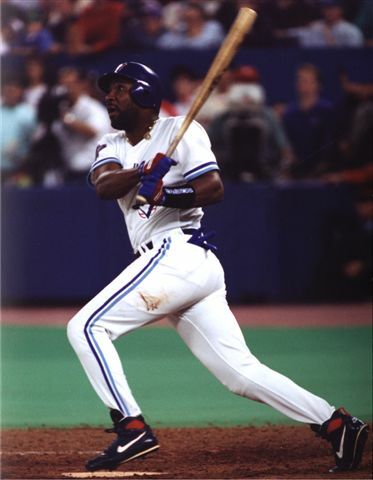 After competing for the home run lead with Kelly Gruber, who hit a record 23 in Canada in 1990, McGriff was traded at year end to the Padres for Roberto Alomar and Joe Carter, two players who would become key to the Jays’ future. Carter made an immediate impact. He tied Gruber’s season record during the 1991 season, and followed that with two seasons of 20-plus local home runs. After unsuccessful postseason campaigns in 1989 and 1991, the Jays won back-to-back World Series championships in 1992–1993. Carter hit four home runs in Toronto during those two playoffs runs, for the career lead. Of course, this includes the most memorable Canadian home run, his walk-off shot against Mitch Williams that ended the 1993 World Series. This is still the last postseason game played on Canadian soil. Joe Carter continued his slugging ways and on August 6, 1997, he became the lone Canadian home run king with his 122nd home run, a shot off the Indians’ Jaret Wright, moving him past Gary Carter. Joe Carter left the Jays after the 1997 season, and ended his career after one more season, split between the Orioles and Giants. He concluded his career with 127 Canadian home runs. Slugger Jose Canseco made his mark in Toronto during his eventful career. In the 1989 American League Championship Series, he blasted a Mike Flanagan pitch into the fifth deck of the Skydome. The official estimate put the distance at 480 feet, but teammate Rickey Henderson evaluated the shot at 600 feet.8 In mid-1997, he broke Jim Rice’s record of 18 home runs as a visitor in Toronto. The next season, he was signed by the Jays, with whom he had a monster year, breaking the season-record with 25 Canadian home runs. He finished his career with 25 home runs as a visitor in Canada, all but one in Toronto. Two young and powerful hitters dominated the Canadian baseball scene in the late 90s and early 00s: Vladimir Guerrero in Montreal and Carlos Delgado in Toronto. Delgado got a regular gig in 1996, Guerrero in 1997. At that point, MLB had introduced interleague play, and both homered in the first Canada-only MLB game when the Expos visited the Jays on June 30, 1997. Guerrero was the season leader for home runs in Montreal six straight years, from 1998 to 2003, topping at 25 in 2000. Delgado reached 30 home runs in Toronto that same year, shattering Canseco’s record. It was the first of five times that Delgado was Toronto’s yearly leader between 1997 and 2004. Delgado reached the 100 home run plateau first, on August 6, 2000, by going deep against the Rangers’ Ryan Glynn. Guerrero followed a year and a half later, on April 16, 2002, with a shot off Jesus Sanchez of the Cubs. 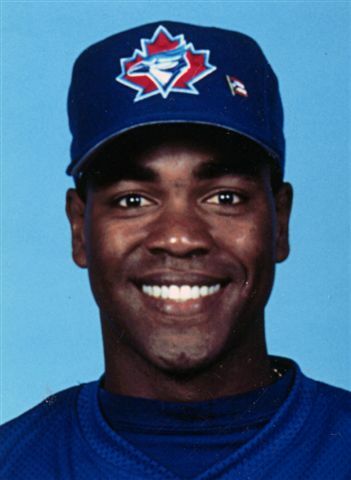 That same season, Delgado became the undisputed Canadian home run champ, eclipsing the mark held by Joe Carter. He broke the Canadian record with his 128th home run on August 29. His iconic moment came on September 25, 2003, when he went deep four times in the same game against the Rays. During this period, baseball was in its dying days in Montreal. The club had been purchased by the league in 2002, and in 2003 and 2004 a number of home games were moved to Puerto Rico. The team was put out of its misery with a transfer to Washington in time for the start of the 2005 season. Guerrero, set to become a free agent after the 2003 season, just managed to pass Gary Carter for the Montreal lead. He hit his 122nd home run, the one that put him ahead, on August 25, with a mere 10 home dates left. Delgado left the Jays after the 2004 season and he did not homer in Toronto in the few opportunities he had before retiring, his Canadian total stopping at 178. Replacing Delgado as the main power threat in Toronto, Vernon Wells has climbed the rankings, becoming the 7th player to reach 100 career Canadian home runs on September 4, 2008, with Canadian-born Jesse Crain of the Twins the victim. Traded to the Angels after the 2010 season, Wells sits in third place, with 129 long balls. He is only eight behind Vladimir Guerrero, but needs an even 50 to dislodge Delgado. The latest movement atop the Canadian home run leaderboards came courtesy of Alex Rodriguez. He established himself as the most successful visiting slugger in Toronto with his 25th home run late in the 2005 season. During the last game of 2010 at Rogers Centre, on September 29, he took a Brett Cecil pitch to deep left-center field to move ahead of Mike Schmidt and become the visitor with the most home runs in Canada (33). Among these shots we find a July 2008 home run, the 537th of his career, the blow which moved him ahead of Mickey Mantle on the all-time list. 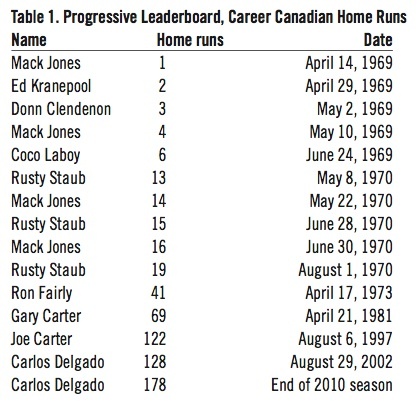 Tables 1 and 2 below present the lead changes for career home runs in Canada. 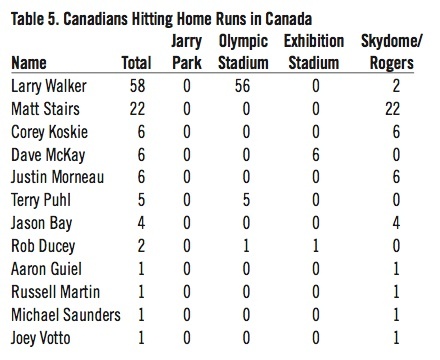 Tables 3 and 4 list the top 20 for home runs in Canada, globally and for visitors. Table 3 contains the usual suspects, the Expos and Jays stars. Darrin Fletcher is possibly one name that would not immediately come to mind, as he split evenly his 60 career home runs between Montreal and Toronto. A-Rod should build a considerable lead in the next few years, as no active player seems likely to catch him. 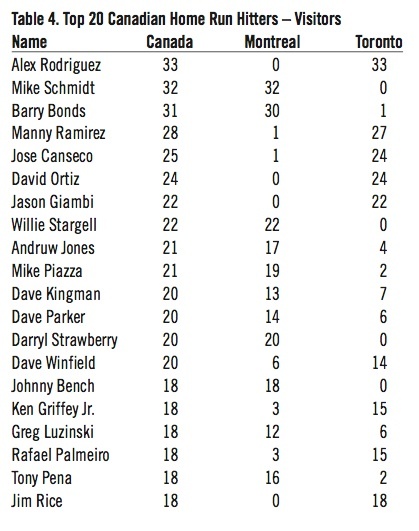 Most of the greatest sluggers of the past 40 years found their way on the list. Among the absentees, Mark McGwire, Jim Thome, and Frank Thomas have the excuse of spending their careers in the wrong division, while Reggie Jackson was mostly in the wrong league altogether. The only ones that missed the cut due to subpar performances in Canada are Sammy Sosa (15 home runs in 304 plate appearances), Eddie Murray (14 home runs in 481 PA) and Jeff Bagwell (10 home runs in 284 PA). The surprising name on the list is catcher Tony Pena, who has only 107 career home runs in total. He was particularly effective in Montreal, with 16 home runs in 288 plate appearances. Outside Canada, he had 89 home runs in 6,672 PA. Pena was one of the many non-star players who particularly enjoyed hitting up north. The most extreme split probably belongs to Nelson Santovenia. He played all but six of his 297 career games for the Expos. In 460 plate appearances at Olympic Stadium, he had a .277 average with 15 home runs and a .457 slugging percentage, very good numbers for a backstop. However, away from Montreal, he struggled to a .195 batting average in 512 plate appearances, with 7 home runs and a .283 slugging percentage. Another interesting outlier is Doug Loman, infielder for the Brewers, who hit the only two home runs of his career in the same September 1984 game at Exhibition Stadium. 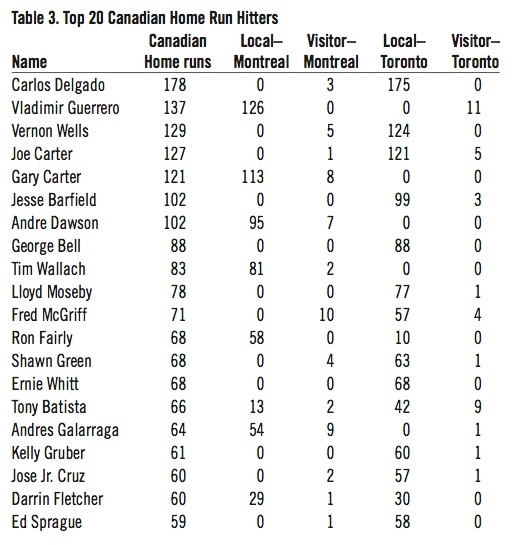 In this table, we find the names of Dave Winfield and Dave Parker, both of whom share a unique feat: they are the only players to hit home runs in all four Canadian stadiums. Many homered in three stadiums, but as Jarry Park closed after the 1976 season and SkyDome opened during the 1989 season, it took a long career, as well as switches between the two leagues, to achieve that feat. Surprisingly, the number of Canadians hitting home runs on their native soil is slight. No Canadian homered at Jarry Park, and we had to wait until 1980 to see this for the first time, when Terry Puhl homered for the Astros in Montreal. Here is the complete list of Canadians homering in their country. With the Expos’ history complete after 36 seasons and the Blue Jays in their 35th season, we are at a quasi-symmetric moment in Canadian MLB history. Obviously, each passing season reduces the presence of Montreal and the Expos in the leaderboards. 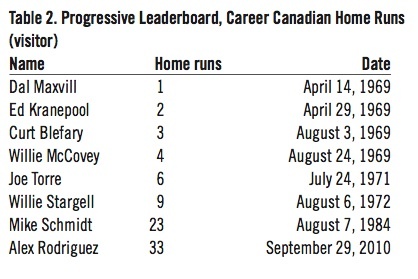 The Blue Jays have been atop the Canadian home run list since 1997, first with Joe Carter, then with Carlos Delgado. With the trade of Vernon Wells, we also enter a new era dominated by the surprising Jose Bautista, who shattered the season record with 33 home runs in Toronto in 2010. Bautista entered the 2011 season with 40 career Canadian homeruns and a guaranteed contract with the Jays up to the 2015 season. Bautista would need to average 28 home runs in Toronto per season to catch up to Delgado before the end of the contract.10 While that seems unlikely, he is currently the most serious challenger for the Canadian home run crown. And with rookie Brett Lawrie in the lineup, the Blue Jays now have a Canadian power hitter who could challenge Larry Walker’s mark. Data compiled from the Baseball-Reference website, www.baseball-reference.com, which includes the Tattersall/McConnell homerun database. Special thanks to William Young who helped improve the article. CHRISTIAN TRUDEAU is an assistant professor of Economics at University of Windsor, Ontario. The Quebec native and orphaned Montreal Expos fan just had to look across the river for a new team to cheer for, the Detroit Tigers. 1. Ted Blackman, “Expos split with Giants,” Montreal Gazette, 25 July 1970. 2. Bill Christine, “Pirates win despite rash of goof-ups,” Pittsburgh Press, 17 July 1969. 3. Associated Press, “Stargell explodes on Expos,” 21 May 1978. 5. Montreal Gazette, “Clubhouse not ready for Expos,” 16 June 1977. 6. Joe Sexton, “Strawberry’s Home Runs: Going, Going, Still Going,” New York Times, 1 August 1988. 7. Associated Press, “Expos’ streak reaches 9 in a row,” 16 June 1997. 8. Thomas Boswell, “O Say Can You See Where Jose’s Homer Landed in the SkyDome,” Pittsburgh Post-Gazette, 9 October 1989. 9. For more details on Canadians homering in Canada, see Matchett, David, Homering in the Home Land, mimeo. 10. More precisely, his contract contains a team option for the 2016 season. If Bautista averages anywhere near 28 Canadian home runs a year, that option will certainly be picked up. He would still need an average of 23 home runs over these six years.